Time flies! But the baby robins aren’t yet. Nevertheless, they are growing and the most amazing thing is the feather development! Baby Robins, Day 7, early morning. They usually are sleeping until at least 9am. 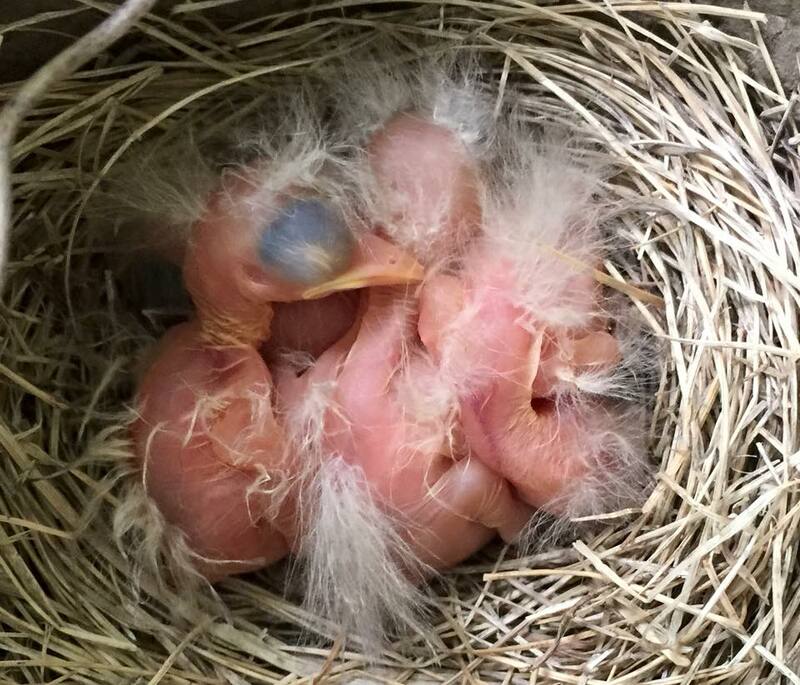 Baby Robins, Day 8. Good morning! "Where's breakfast?" Day 8, headfeathers coming in. Day 8, feathers up close. See that tiny toe peeking out? Day 8, another look at the feather development. This entry was posted in Animals, iPhone and tagged baby robins, feathers, robin on May 8, 2012 by Karyn Traphagen. We have a nest of robins in the Star Magnolia bush right by our front porch. I’ve been taking some photos (trying not to upset the mom too much). Usually just one per day. Three eggs hatched on Friday, the final egg was hatched on Saturday. On Sunday, you can see that the eye slits are starting to develop. Stay tuned! The four eggs in the nest. This nest was re-used from last year. The "outer" nest was lined with some new material. On Friday, April 27, we found that 3 of the eggs had hatched! On Saturday, April 28th, the fourth (and final) egg hatched! You can see the difference in size. The last to hatch is at "7 o'clock" in the nest. On day 3, you can see the eye slits developing. Here you can see the back of the head, the back of the body, fluffy down, and where the feathers will emerge from. This entry was posted in Animals, iPhone, Photographs and tagged bird development, hatchling, nest, robin, robin eggs on April 29, 2012 by Karyn Traphagen.